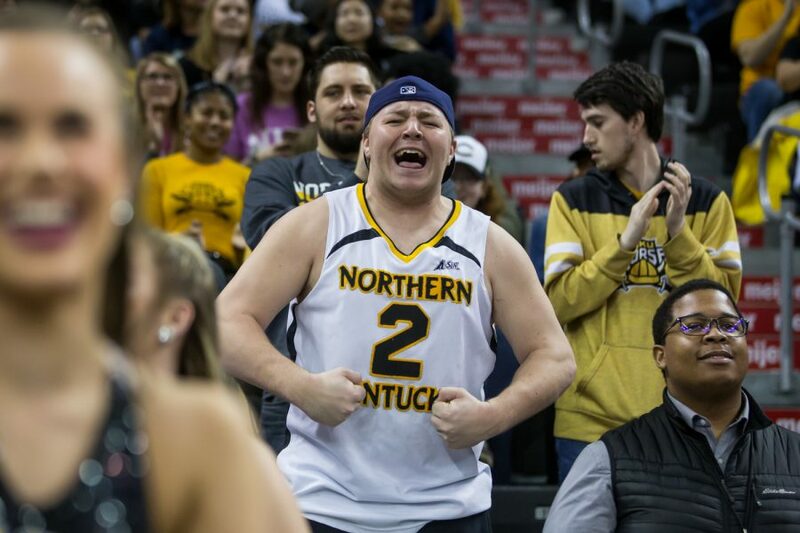 NKU students cheer after a Norse point during the game against Detroit Mercy. The Norse defeated Detroit 97-65. 5NKU men’s basketball team is on top of the Horizon League with only one loss on the board. On Saturday, Feb. 9 at 7 p.m. the Norse look to settle the score against Oakland in the main event of Homecoming weekend. It’s also Kenton County Night meaning tickets will be $9 with proof of residence. This game is important for not only the Norse to not only remain on top of the Horizon League, but also for Oakland, whose ranking would get a boost from a Norse loss. Oakland (7-5) currently sits at number three behind number two Wright State (8-4) and league leader NKU (9-3). It’s a bit of deja vu: the last time the Grizzlies and Norse met, it was a fight to the last second to see who would come out on top of the Horizon League. Oakland dominated with home-court advantage. Recently, Head Coach John Brannen has attributed home wins to the help of the crowd. The Grizzlies’ redshirt junior guard Jaevin Cumberland averages 17.4 points and 80 assists on the year and shot 87 percent from the free throw line. Against the Norse, Cumberland chipped in 15 points, sinking 4 of 4 from the free throw line and 6 assists. Junior guard Tyler Sharpe and redshirt junior Jalen Tate led the Norse with 14 points apiece in the last showdown. Senior forward Drew McDonald was held to 13 points and 9 rebounds (he normally averages 19 points per game and 10 rebounds). NKU leads in defensive rebounding in the Horizon League with an average of 27.4 per game while Oakland sits at the bottom of the league, averaging 21 defensive rebounds per game. On the offensive end, NKU ranks second with an average of 79.5 points per game and Oakland is ranked third scoring an average of 77.4 points per game. In a wider look at the league, Oakland has lost to Wright State 89-73, Milwaukee 67-64 and IUPUI 73-71. The Norse beat both IUPUI and Milwaukee by double digits and Wright State by 4 points. The Norse are also hot off a Thursday win against Detroit Mercy at BB&T Arena. Some national attention for their stellar offense doesn’t hurt, either: NKU men’s basketball is currently ranked 20th and 21st on collegeinsider.com and midmajormadness.com and are the only team ranked out of the Horizon League in the Top 25. The teams are almost evenly-matched when it comes to scoring efficiencies, so Saturday’s Homecoming game will truly come down to grit and who wants the win more. NKU Norse v. Oakland Golden Grizzlies. Saturday, Feb. 9, BB&T Arena, 7 p.m. Watch live on ESPN3.